Joshua found a penny on the pavement. He put it in his pocket. Later that day, he put his hand in his pocket and pulled out the penny. 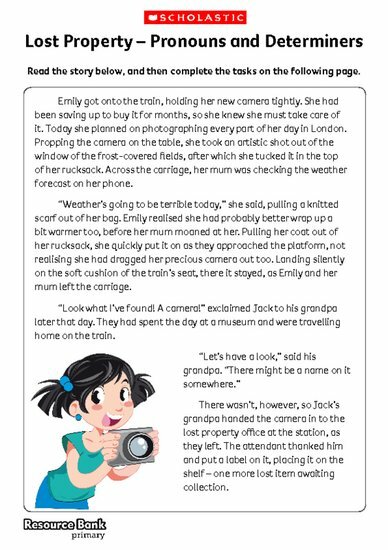 Read the ‘Lost Property’ story and discuss how the people and lost object have been referred to throughout. Working in pairs, follow the instructions on the sheet to identify the use of pronouns and determiners. Then ask children to plan and write a ‘Lost Property’ story of their own, using the planning grid on the sheet. When they have finished, ask the children to share their writing with a partner and identify the different ways the lost items and people have been referred to, underlining determiners and pronouns.